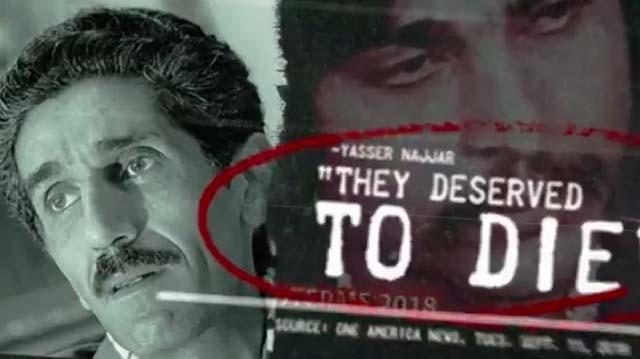 A new 30-second commercial, appearing on Rep. Duncan Hunter’s YouTube channel and shared via Twitter, depicts his Democratic opponent as a security risk bankrolled by the Muslim Brotherhood. The ad was posted about the same time that the Los Angeles Times quoted a spokesman for Hunter as denying that Hunter — in well-publicized remarks in Ramona — labeled Campa-Najjar a Muslim. In a talk Monday to a GOP women’s club in Ramona, Hunter noted a legal name change by Campa-Najjar to remove “Yasser” (his father’s name) from his legal name and add “Joseph” as well. Hunter’s campaign didn’t immediately respond to a request for comment on the new commercial, which was tweeted by the anti-Muslim account of Amy Jane Mekelburg. The new video was posted by @AmyMek and had 7,500 views as of early Thursday afternoon and was retweeted nearly 1,000 times. Ammar is the Grandson of the Munich Olympics Jihadi who orchestrated the slaughter of 11 Israeli Olympic athletes & coaches. Mekelburg, a New Yorker who was the subject of stories in Huffington Post and The New York Times, has 232,000 Twitter followers. The Hunter ad also quotes an unidentified expert referring to a “well-orchestrated plan” by Muslims to take over Congress. The speaker is Joseph John, a retired Navy captain and “FBI analyst” whose clip was pulled from a news segment (“Experts Warn Rep. Hunter’s Opponent Is National Security Risk”) two weeks ago on San Diego-based One America News Network. Shawn VanDiver, the 50th District candidate’s supporter, also said he wasn’t aware of the ad airing on TV. In any case, VanDiver said, Campa-Najjar’s grandfather wasn’t the mastermind of the 1972 Munich Olympic attack — as alleged in the commercial. “This guy was,” he said, sharing a link. VanDiver also pushed back against the title of the ad, which calls Campa-Najjar a security risk. “Hunter would currently be disqualified from acquiring a security clearance due to his pending criminal investigation and financial insecurity,” he said via email. John, in the ad, also said Campa-Najjar was backed by CAIR, the Council on American-Islamic Relations. Eugene W. Fields, a Los Angeles spokesman for CAIR, said he became aware of the ad earlier Thursday afternoon. Fields noted that CAIR, as a 501(c)(3) nonprofit, is not allowed to endorse individual candidates. “Furthermore, CAIR has not endorsed or supported any political candidate in any race,” he said. Fields described CAIR as a group that seeks to enhance understanding of Islam and empowering American Muslims through advocacy efforts and legal representation. Its mission also includes protecting civil liberties and promoting justice. “After his recent indictment for allegedly misusing of campaign funds, it is not surprising that Rep. Hunter would choose to not stand on the merits of his own candidacy and/or his record in Congress but would instead choose to incite fear among voters through lies and intolerance,” Fields said. The YouTube version of the Hunter ad — which ends: “I’m Duncan Hunter, and I approved this message” — had 28 views as of 3:45 p.m. Thursday. “Comments are disabled for this video,” said the account of the indicted East County congressman.